For those of you who haven’t heard A.K.A.Pella yet, you’re going to be impressed. It’s very hard to believe that it isn’t music. It sound so real! But when I say that, it can just mean that some of the guys are able to make weird noises that sound like guitars and drums. A.K.A.Pella is more than that. They are so creative, and they have beautiful voices. There are really nice harmonies throughout the album. I am planning on listening to this album year round. If you are strict during the sefira, it’s not for you (for the sefira at least), because like I said it sounds very real. I am the type of person that gets sick of an album way to quickly. I was always that kid that had everyCD, until I stopped downloading music illegally (when I became religious) and still was known for having an unusually large music collection. I say this because this is a particular problem during the sefira. 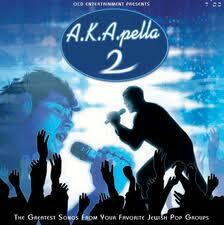 How many acapella CDs are there? I’m not sure of the exact number, but listening to three or four albums over and over on my long commutes gets old quickly. Thankfully, artists have been putting out really unique acapella music. If not for that, then my sefira playlist would sound like one long album…Don’t get me wrong, I love the acapella CDs that are just beautiful harmonizing, but this is just something different. A lot of the songs, particularly L’Cha, Ivdu, Im Lavan, and V’havienu, have a very unique feel, and the whole album sounds, well, different. A lot of the intros sound familiar, but I don’t know where they come from. When I used to listen to secular music, I generally didn’t listen to typical pop music, and today I get non-Jewish music from the gym. I am listening to the songs as though the original version were written by A.K.A. Pella. The secular intros, etc., tend to be catchy and fun, but secular music today has horrible lyrics 95% of the time. So they took out the horrible lyrics and instead used the best lyrics possible… It sounds like the perfect combination. Still, I don’t want to be thinking about Beyonce when I listen to music, so I’m just pretending that it’s not Beyonce and it’s just a fun intro that sounds familiar! That being said, this album isn’t for everyone, specifically because of the use of secular songs throughout the album. Thatbeing said, it’s very good! I think all the songs are parodies, but I’m not sure. I personally recognize L’Cha (a Backstreet Boys song from my middle school days), Gadol (“What if G-d was one of us…just a stranger on the bus…” from my elementary school days), Ivdu (“I’m the lyrical gangsta” from 1994), and Im Lavan (Beyonce’s Crazy In Love). There are also numerous songs that are covers of Jewish songs, but being that this album came out when I was in high school in the deep south listening to bluegrass, I don’t know so much Jewish music that came out before this time (early 2007). I wish that I knew which songs were covers and which are original, but it doesn’t matter too much, because all of the songs are good. Compared to the other A.K.A.Pella albums, I’m going to rank this one number 2 (behind Platinum). That’s mainly because on Platinum I know almost every song since they are newer songs. For only being the second album, and for being so experimental, it really is an amazing success. There is a very…for lack of a better way to say it…pleasant feel to the album. It sounds like they are having so much fun singing (whats the verb for making the guitar like noises and whatnot?) the fast songs, which there are four of, arguably–L’Cha, Ivdu, Im Lavan, and V’havienu. The slow songs are sung delicately and with love. There are four of them, as well- Gadol, Ekra, R’faeinu, Umacha. There are then a handful of songs that are somewhere between the fast and slow ones– Raninu Tzadirkim, Baoo, Nar Hayisi, and the Bonus Track. But generally speaking, it sounds as though they were all in a good mood while recording the album, and when that happens, the good mood spreads to the listeners. For the first time, I’m not going to go through each song individually, so we’ll see how it goes. Backstreet Boys + The Chevra! Who would’ve though it’d work so well? This song is tons of fun and great to listen to while driving. You’ll be singing along the first time around. Again, Beyonce + Lev Tahor! Just like L’Cha, this song is a lot of fun though not quite as high energy. The intro and other parts are Beyonce, but the rest of the song is pretty true to the Lev Tahor version. The Kol Noar Boys Choir are guest stars in this song, and as we saw on their debut album, they are great! It’s unusual in that they don’t come in til around 1:30 and then stay through the rest of the song. The song is also upbeat but not very high energy. It sounds so real! How do they do that? Very good voices. Specifically, I like that although all of their voices sound different, none are so different from a typical singer that they take over the song. It’s a group singing together, so they have to blend, which they do here. I’m not too crazy about the slow songs. I do like Gadol a lot, but for me slow songs have to be really pretty and moving to be a song I want to listen to often. These sound a little sleepy (almost boring) at times. To add to that, Ekra is almost 7 minutes long, which is too long for a slow song generally speaking. For those of you that want something different to listen to during the sefira, here’s your album! But it’s not just different, it’s a high quality album.